Of all the techniques covered in our guide to 31 different types of meditation, this is perhaps the most important. As a meditation teacher, this is the meditation techniques I teach the most. Now let me shw you how to do it properly. By the end of this guide, you will know how to do Anapansati correctly, and this will give you the power to stay calm no matter what life throws at you. How to get the most out of the experience. How to gain emotional control. Anapanasati meditation is a type of mindfulness meditation. Anapansati (pronounced “An-a-pan-a-sah-tee”) trains the mind to stay calm and balanced. The word Anapanasati literally means “mindfulness of breathing” [read our spiritual words dictionary for more]. So it is a meditation in which we are mindful (consciously aware) of the breath. As meditations go, this is a biggie. Anapansati meditatin is one of the most popular forms of meditation used in Zen Tianati, Theravada, and Tibetan Buddhism. It was originally taught by Buddha more than 2500 years ago. The original instructions are found in the Anapanasati sutta . In the 6th Century BC, Buddha instructed his followers to go into the forest, sit under a tree, and mindfully observe how the breath flows through the body. Spend ten minutes sitting under a tree watching your breath and you will become very relaxed and calm. There are numerous meditation retreats that do precisely this, such as Padmaloka in England, which specialises in Anapanasati. Anapanasati has evolved through the years. Today it is not just a Buddhist practice but a medical and scientific practice too. 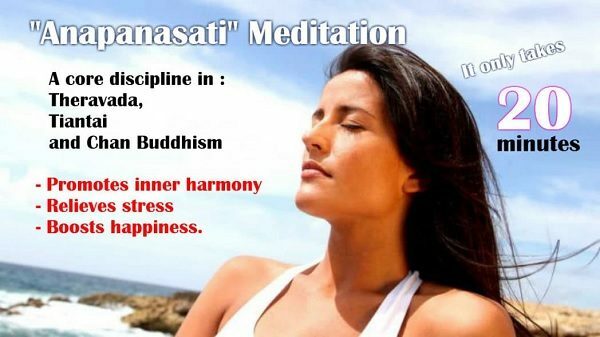 Science has proven that there are many benefits of Anapanasati meditation. In THE DAILY MEDITATION’s guide to 100 benefits of meditation we revealed the powerful effects meditation has on body, mind, and spirit. Many of those benefits are specific to Anapanasati. In terms of the spirit, Buddha said that Anapansati is a vital stage on the path to enlightenment . And finally, Anapanasati leads to freedom from suffering. So essentially, Anapanasati will help you to achieve enlightenment. Then there are the health benefits of Anapanasati. There are so many reasons to tart to use basic breathing meditations. Life is better when you practice Anapansati every day. I’ve learned that through personal experience. When I was a teenager I went through a very rough time. I was bullied every day. Life at home was always difficult because of my dad’s drinking. And there was a lot of turmoil in my life. I decided to learn meditation. I knew some basic breathing meditations. When I was stressed I would focus my mind on my breathing. As I focused, my thoughts began to quieted. The demons in my mind began to part. My mind cleared. 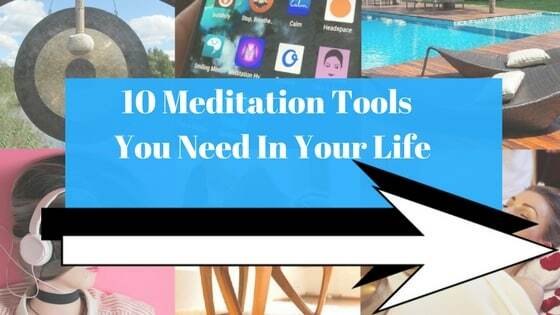 Meditation helped me get through a very rough patch in my life. Now I practice meditation every day, so I stay relaxed and stress free. Millions of people do the same thing. The world is waking up to the fact that meditation massively helps with stress and other problems of the mind. And Anapansasti is one of the best meditations to learn. Though of course there are alternatives, such as Ayurveda breathing technique(Kapalabhati). You want the power to calm your mind. 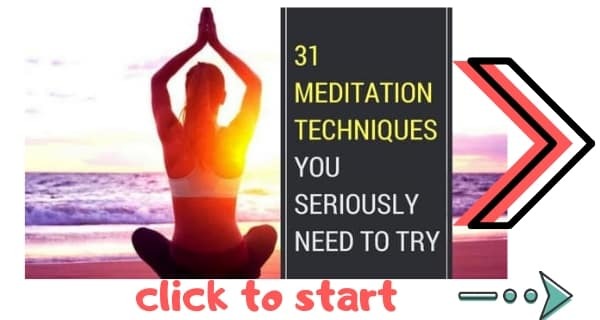 And for that you need to learn to meditate the right way. My guide to the basics of meditation covers essential tips and strategy that will make you a successful meditator. It’s vital to start correctly, so take a look at that link and read the instructions before continuing. When the Buddha taught Anapanasati in the Satipatthana Sutta he said that monks should go into the forest and sit beneath a tree (you yourself could do this if you have a Zen garden). In the forest monks would sit and watch the breath. The Buddha instructed monks to notice if the breath is long or short. Allow the mind to calm and become still. That is the original teaching on Anapanasati. Take a look at my article How To Create A Meditation Space. A proper space is important because it helps you to relax. Your area should be quiet and peaceful. It is easy to get distracted when practicing Anapanasati Meditation technique, so make sure that there are as few distractions as possible. You should also consider lighting. The area should not be too light nor too dark and it should be a comfortable temperature. You don’t want to be shaking or sweating profusely when you meditate. I always recommend doing Anapansati seated and in a good meditation cushion or chair. It is possible to do Anapanasati meditation technique in various postures. You can do it lying down, standing, or sitting. You can use whichever pose you’re happiest with. Just makes sure you have good posture. Here is the proper sitting position for Anapanasati meditation. I like to practice Nine Round Breathing to helps myself to relax. But you can relax anyway you see fir. Just make sure your mind is relatively calm before continuing. You might like to count breaths, stretch your body, or just take a few moments to let go. Begin to focus on your breathing. If you find that you are struggling to concentrate, count your breaths up to ten and then start over. Alternatively, move your focus to a different part of your breathing, a part that appears clearer. You can also count for the entire meditation if you wish, but this is only for beginners. Once your mind is fully focused, maintain that focus for a minimum of five minutes. After this, you may wish to adapt your technique depending on your reason for practicing (try these techniques to go deeper in meditation). If you are meditating in order to develop understanding of yourself, you may wish to observe your thoughts. If you are aiming purely for focus, keep concentrating on your breathing. You may also use visualisations and other techniques at this point. Now that you know how to do Anapanasati meditation technique, you may wish to vary it, depending on your reasons for meditating. Focus on the entirety of the breath. Imagine the breath as one. There is no in or out there is just breathing. Meditating on the oneness of breathing helps develop inner stillness. Focus on the energy behind the breath. There is an energy, or a lifeforce, behind the breath. When you meditate on this you will find what I term Infinite Creativity—the most elemental part of ourselves. When you connect with this part you will find immense freedom and power. Meditate on the connection between mind and breath. You will find that the way in which you breathe alters your mental state, and vice versa. Mindfulness: Observe your thoughts to discover the truth of yourself. Impermanence: Notice how each breath is different, how body and mind continually vary. We are like liquid—always moving—and yet we may be inwardly still. Try humming or reciting “Om.” This will tune your mind body into the frequency of the sound. Traditional Anapanasati meditation progresses through 16 stages broken into four tetrads (groups of four practices). These stages of Anapanasati are not for beginners. If you are a beginner, practice Anapanasati meditation only so far as mindfully observing the breath. Once you have gained practice, progress through these sixteen stages. We begin with the first tetrad. The first tetrad is being simply mindfulness of breathing (physical sensation) and noticing whether the breath is long or short. This then leads to mindfully observing the breath through the whole body. We then use this to relax the body. We now come to the second tetrad. At this stage, Anapanasati becomes more of a contemplative meditation technique. This stage of Anapanasati is all about feelings and emotions. Because the mind and body are relaxed we will experience the feeling of rapture (piti). The second stage of Anapanasti is to observe these feelings mindfully. The Anapanasati sutta recommend maintaining mindfulness of breath while also observing these feelings. Mindfulness of breath is used as the anchor so we do not get drawn into the feelings and lose ourselves. Like Thich Nhat Hanh said, “Feelings come and go like clouds in a windy sky. Conscious breathing is my anchor”. We use the breath to keep the mind anchored while we mindfully observe our feelings. You will notice that the mind tries to avoid negative feelings and is attracted to positive feelings. Once we are aware of this process we can label them as craving (the more wanting more positive feelings) and aversion (the mind wanting less negative feelings). We can then stop this perpetual to-ing and fro-ing. The third tetrad deals with emotions and with the mind. Because we have learned to stop reacting to our experience we can be more inwardly calm and happier. The next step is to observe how the mind is filled with joy. Our more joyful mind is now more still. This leads to heightened concentration. This tetrad is all about freeing the mind by using reflections. In this tetrad we reflect on the impermanence of experience and the continually changing nature of thoughts, feelings, emotions, and sensations. This is done by mindfully observing how these elements change as we meditate. Take a look at our Beginners Buddhist Meditation Plan. 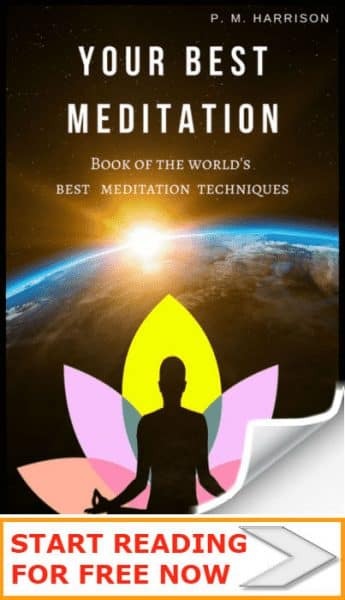 It will provide you with a guide you can follow to learn Buddhist meditations. In that guide you will learn other Buddhist techniques so you can compare them. For instance, many people ask about Anapananasti VS Vipassana (short answer: Anapanasati develops focus so we can then observe the mind in Vipassana). And that’s the end of this guide. I hope you’ve enjoyed it and found it helpful. Please share this on Facebook / Twitter / wherever you like. Anapansati: A form of breathing meditation devised by Guatama Buddha. Theravada: One of the most popular forms of Buddhism with 100 million practitioners. It’s principle teachings come from the Pali Tipitaka or Pali Canon and its basic teachings begin with the Four Noble Truths. Meditation: The act of focusing the mind as used in Buddhism, yoga, and health practices. Buddhism: One of the most popular religions in the world, based on the teachings of the Buddha. Sati (mindfulness): The Pali word for mindfulness, translated to mean the act of bringing into one’s focus. Dhamma Vicaya (analaysis): Translate to mean analysis, Dhamma Vicaya is connected to discrimination, examination, investigation and wisdom. Viriya (persistence): A Buddhist term, Viriya means energy, effort of persistence. Piti: Rapture, which essentially means that you are joyful and enthusiastic in meditation. Passaddhi (serenity): Passaddhi is a Pali term that is translated to mean repose, serenity or calmness. Samadhi (concentration): A state of intense focus and concentration. In Hindu forms of yoga, Samadhi is the ultimate final stage of meditation. Upekkha (equanimity): Equanimity is one of the sublime states in Buddhism. It means stability in the face of worldly fluctuations. Hi Kalyanjyoti, thanks for your message. It is natural for the mind to wander when you hear something, such as the birds chirping. Do not be hard on yourself when this happens. Simply label the source of your distraction. Think “This is just a sound”. And then return to focusing on the breath. One of the important things with Anapanasati is to accept the fact that the mind does sometimes wander, and then return. This is natural. If you want to be more focused on your breath, you might like to try Dhyana, which takes things a step further. Of course, our book Journey To The Buddha Within You provides the most in-depth tutorials that will help you to improve.